A pregnant lady, her husband and their friend are currently in police net in Lagos for kidnapping a 23-year-old man, Idris Saheed, and demanding a ransom. 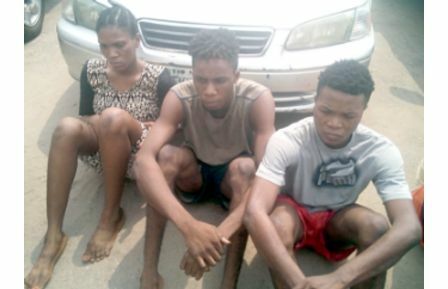 The pregnant lady, 21yrs old Eniola Kareem, her husband, 23yrs old Paul Kareem, his friend, 21yrs old Ayoola Sodiq, were arrested after the payment of N100,000 ransom into Paul’s account by the victim’s parents. On his part, the husband Paul said: “I planned it with my wife. I met her in a club, where I dance and we started dating. The person we kidnapped told my wife that he was coming to the house, thinking she was still single and that was what prompted the kidnap. “We did not harm him or use any ammunition; it was a docile operation. The boy is gentle and cooperated with us. Speaking, the third suspect, Ayoola Sodiq, said: “Paul is my friend. I met him at a club in Mowe Ibafo, where he dances. He introduced me to this business and told me how he was planning to kidnap the victim. “His wife called the boy and when he came to the house, they pounced on him and told him to sit on the floor. They then called his parents and informed them of the kidnap, demanding that they pay N100,000 to her husband’s account.